DEMI LOVATO LIVE IN MANILA! March 20 at the Araneta Coliseum! Demi will surely give her fans a musical treat, as she performs her chart-topping hits, including "Skyscraper", "Give Your Heart A Break", "Here We Go Again", "This is Me" and "Don't Forget", plus songs from her upcoming album, such as the new hit song "Heart Attack". From Disney's Camp Rock (with The Jonas Brothers) to becoming one of America's X-Factor judges alongside Britney Spears, Simon Cowell and L.A. Reid, Demi has proven to be a global pop superstar, as she is now! Not just an outstanding performer and recording artist, Demi has also built herself as a role model for the youth with various causes, such as being an anti-bullying spokesperson teaming up with America's foremost anti-bullying organization PACER, as well as talking about teen issues all of which she has experienced and successfully overcome, giving her credibility over most stars her age. 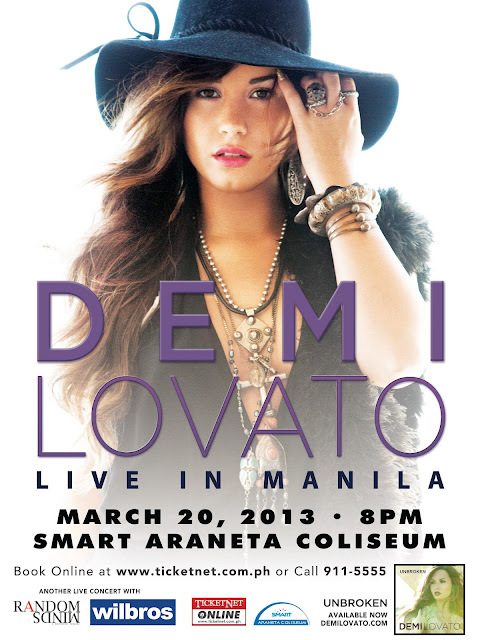 Tickets to "Demi Lovato - Live in Manila 2013" are available atwww.ticketnet.com.ph or Call 911-5555. This event is brought to you by Random Minds Productions (@RandomMindsPH) and Wilbros Live (@WilbrosLive).